Gastonia Dent repair can fix door dings while you wait with repair times ranging from 15 to 30 minutes. Increase the resale value by repairing minor dings! Our master techs can quickly repair severe dents with great results. Avoid costly insurance claims and the deprecation that accompanies traditional bodywork at about 1/2 the cost of traditional body shop repair. We can also work with your insurance company on your claim. 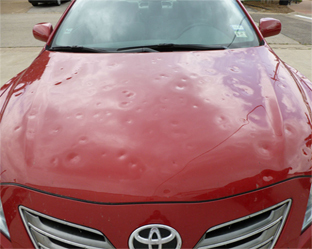 We offer free hail damage repair estimates. Our knowledge and working relationship with insurance providers ensures a timely and quality repair. Contact us today and return your vehicle to like new condition! We offer Paintless Dent Repair (PDR) for small dents and dings. If you have a few small dents without paint damage or creases then we could likely use PDR to repair your vehicle. Paintless dent repair is a great, quick, and less expensive way to repair your vehicle than traditional auto body repair, and doesn’t require materials. We can perform paintless dent repair while you wait. Paintless dent repair is typically significantly more effective than traditional body repair. While every repair is unique and prices depend on size, location, and severity, typical PDR prices range from $75 to $125 per dent. Most paintless dent repairs can be completed in the same day, often while you wait. Call or email us today for more information about Dent Ambulance paintless dent repair.